Can I Be Allergic to Mozzarella Cheese? Mozzarella cheese has an elastic texture, which rolls neatly into a ball after kneading. 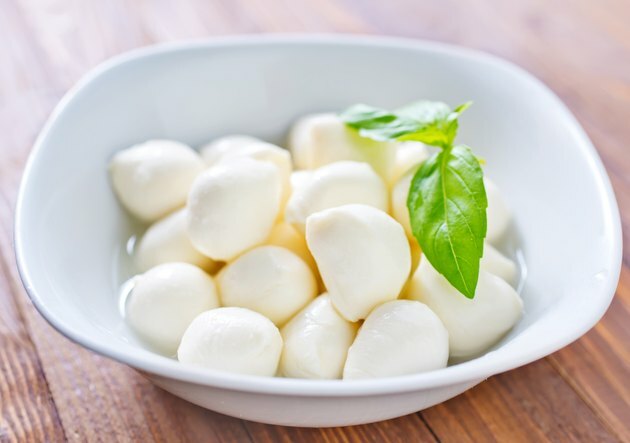 Originally made in Naples, mozzarella cheese is a staple in many Italian dishes and a common pizza topper. If you notice yourself feeling ill after eating mozzarella cheese, do not automatically assume that the cheese is bad. You may actually be experiencing an allergic reaction. An allergy to mozzarella cheese is actually the body's response to a protein called casein. According to the Massachusetts Institute of Technology, all mammals' milk contains casein. Made from the curd of cow, goat, sheep and sometimes buffalo milk, mozzarella cheese, like all cheese, contains casein. In fact, it is the casein proteins that combine to form the curd. If you have an allergy to mozzarella cheese, it is more than likely that you are also allergic to milk and all products derived from milk. If you are allergic to the casein protein in mozzarella cheese, you will begin to experience symptoms that range from mild to severe. It may take minutes, hours, and in some cases, days, for casein allergy symptoms to manifest after eating mozzarella cheese or other milk products. Early symptoms usually include hives, wheezing and vomiting. As symptoms progress, you may develop abdominal pain, diarrhea, skin rash, coughing and a runny nose, according to Eastern Illinois University. Anaphylaxis, or restricted breathing, shock or loss of consciousness may also develop with casein allergies. Seek medical attention at the first sign of allergy symptoms to prevent a life-threatening health emergency. An allergic reaction to the casein protein in mozzarella cheese is different from an intolerance to lactose, although the two are often confused. Lactose is a natural sugar found in milk products. If you are lactose-intolerant, you will develop gas, bloating, abdominal pain, loose stools, diarrhea and sometimes, nausea, after eating milk products, according to the University of Georgia College of Family and Consumer Sciences. This is because your body lacks an enzyme known as lactase, which is necessary to break down lactose sugars into smaller molecules. A casein allergy does not mean that you have to rule out eating mozzarella cheese altogether. Made from bean curd, tofu soy cheese is a milk-free alternative for anyone who suffers from casein allergies. According to the U.S. Soyfoods Directory, soy cheese is low fat, cholesterol-free and nutrient rich. Soy cheese comes in several varieties, including cheddar, American, parmesan and mozzarella. The look and texture of soy cheeses match those made from milk, and they melt almost as well. What Are the Symptoms of a Milk Allergy in a Toddler?